The Statement of Comprehensive Income provides a summary of a company’s net assets (those obtained from sources other those of the business owner) over a given period of time. In other words, the statement highlights the adjustments on equityEquity ValueEquity value, commonly referred to as the market value of equity or market capitalization, can be defined as the total value of the company that is attributable to shareholders. To calculate equity value follow the examples and step-by-step instruction in this straightforward guide from CFI. during a given timeframe. A statement of comprehensive income contains two main things: the net incomeNet IncomeNet Income is a key line item, not only in the income statement, but in all three core financial statements. While it is arrived at through the income statement, the net profit is also used in both the balance sheet and the cash flow statement. and other comprehensive income (OCI). The net income is the result obtained by preparing an income statement. On the other hand, OCI consists of all the other items that are excluded from the income statement. One of the most important components of the statement of comprehensive income is the income statement. It is used to provide a summary of all the sources of revenue and expenses, including payable taxes and interest chargesInterest ExpenseInterest expense arises out of a company that finances through debt or capital leases. Interest is found in the income statement, but can also be calculated through the debt schedule. The schedule should outline all the major pieces of debt a company has on its balance sheet, and calculate interest by multiplying the. Ideally, the aim of preparing an income statement is to find a company’s net income. One thing to note is that these items occur very rarely when it comes to small and medium-sized businesses. It means that the OCI is mainly used to value bigger corporations that encounter such financial events. That said, the comprehensive income is computed by adding the net income – which is found by summing up the recognized revenuesRevenue StreamsRevenue Streams are the money a business earns from the sale of goods or provision of services. The types of revenue that a business records on its accounts depend on the types of activities carried out by the business. Learn about the different types, how to categorize them and minus the recognized expenses to other comprehensive income, which captures any other items excluded from the income statement. The primary purpose of an income statement is to provide information on how a company is raising its revenue and the costs incurred in doing so. 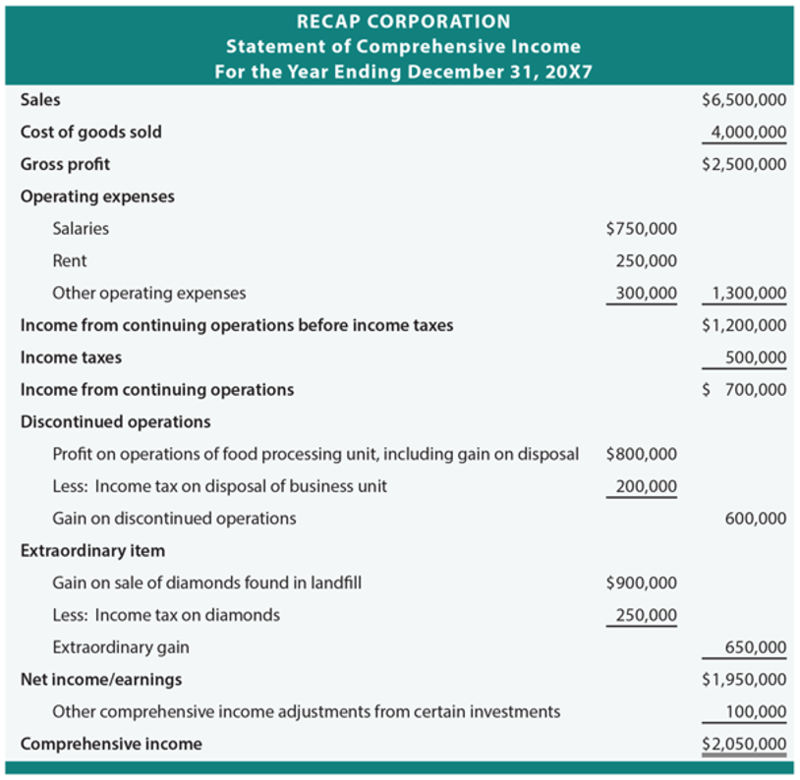 The income statement is very thorough in highlighting these details. Not only does it explain the cost of goods sold, which relate to the operating activities but it also includes other unrelated costs such as taxes. Similarly, the income statement captures other sources of revenue, which are not associated with the managing operations. It entails items such as the accrued interest from business investments. The SCI, as well as the income statement, is a financial report that investors are interested in evaluating before they can decide to invest in a company. The statements show the earnings per share or the net profit and how it’s distributed across the outstanding shares. The higher the earnings for each share, the more profitable it is to invest in that business. Although the income statement is a go-to document for assessing the financial health of a company, it falls short in a few aspects. The income statement encompasses both the current revenues resulting from sales and the accounts receivables, which the firm is yet to be paid. Similarly, it highlights both the present and accrued expenses or rather the expenses that the company is yet to pay. But if there’s a large accrued expense or receivable income, it could affect the net income drastically. It means that the statement of comprehensive income does not depict the true status of a business. Another area where the income statement falls short is the fact that it does not give a lot of information regarding a firm’s future success. The income statement is great for establishing the earnings per share and other past financial records. However, it does not reveal the future trends that the different items will take, be it sales or expenses. It also fails to explain the exact sources of income of the company. A firm could be experiencing an increase in sales by underpaying its workers and overcharging consumers. The statement if comprehensive income reports the net equity of a business enterprise over a given period. The transactions captured in the report are those that result from non-owner activities. The financial statement includes two key parts: the income statement, which outlines the net income, and other comprehensive income, which incorporates the items excluded from the income statement.